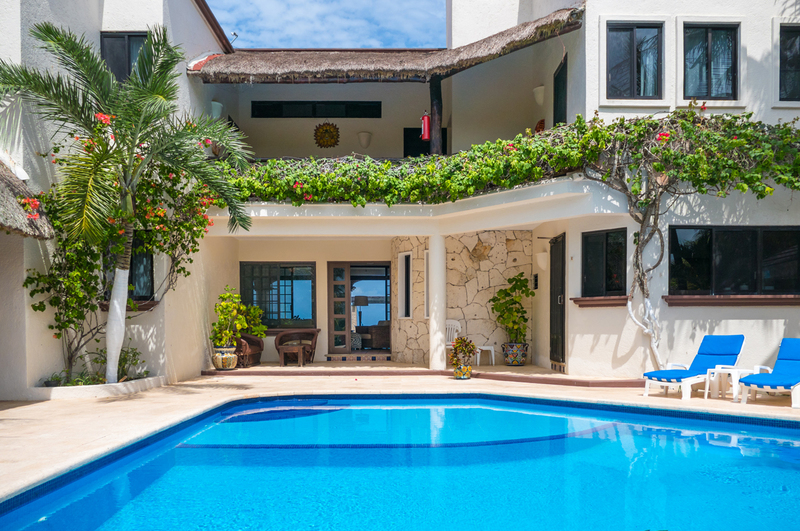 Villa Sea Gate is a delightful 4,000 square foot, 4 bedroom and 4.5 bath, two story oceanfront villa located in the heart of Akumal. 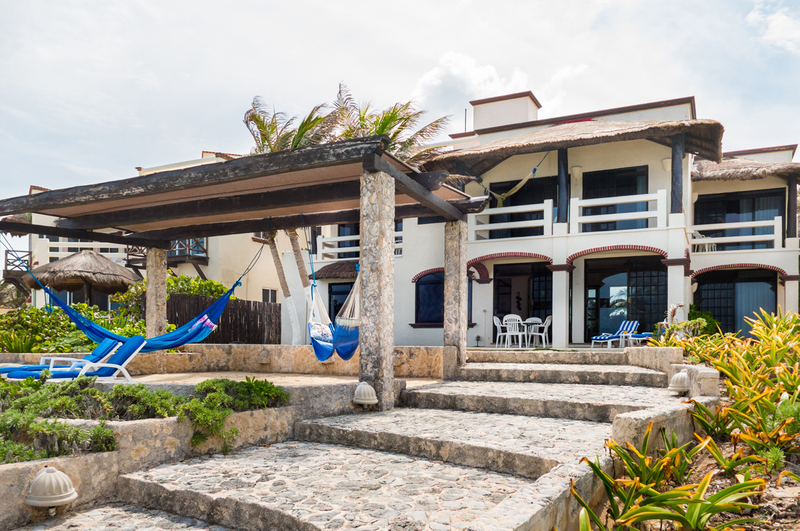 The charming Villa Sea Gate is situated on a stunning rocky coastline and is only a three minute walk to the magnificent beach of Akumal Bay. The spectacular views from Villa Sea Gate with its ideal location makes it a perfect family vacation villa, a true home away from home! 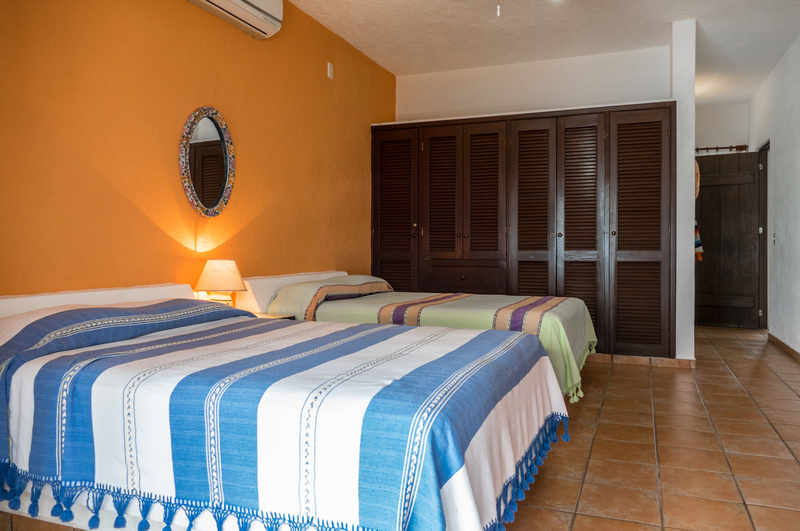 Villa Sea Gate is 20 mins to Tulum, 15 minutes from Puerto Aventuras and 30 mins to Playa del Carmen, by car! 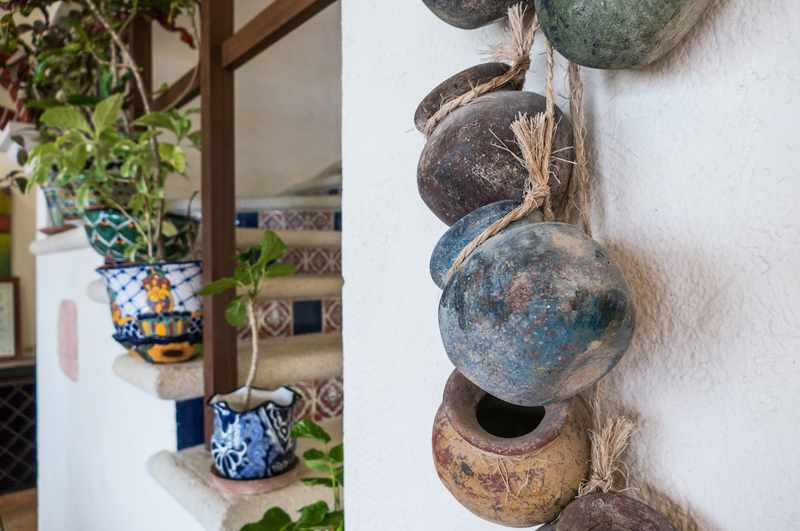 Upon entering the driveway, which provides private parking, the first view to captivate your attention will be the gorgeous, tropical bougainvillea bushes growing up the front of the villa by the pool. These beautiful flowers, with their eye-popping colors, enhances the cheerful poolside atmosphere which boasts a large 21' x 21' square foot swimming pool. 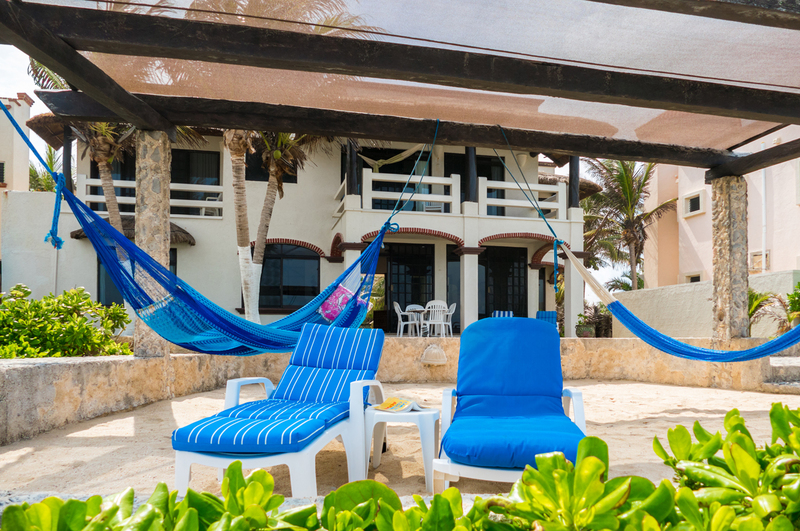 The spacious poolside area offers plenty of outdoor seating for the whole family, an outdoor table and hammock underneath a shady palapa, and outdoor speakers in which to enjoy your favorite music. Only a few feet away from the pool is the charcoal grill and outdoor fryer which will satisfy any outdoor cooking enthusiast. 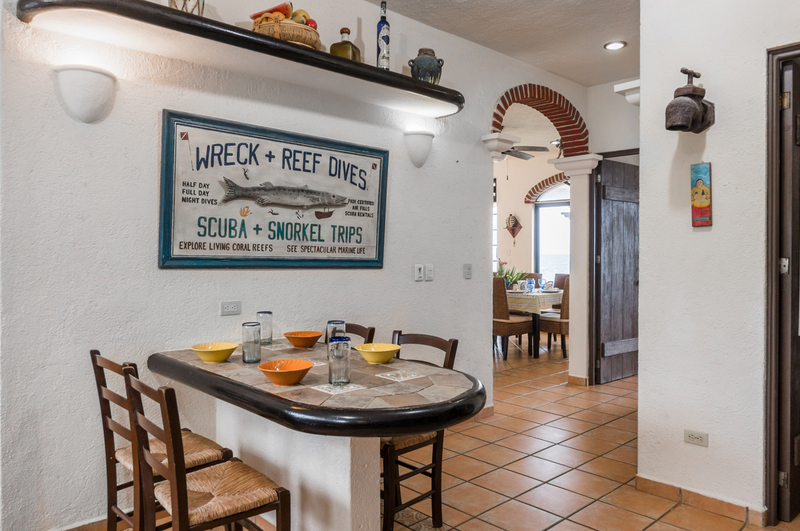 If you would prefer to relax and have the catch of the day prepared for you in your very own villa, this can be arranged as well. Gregorio, the caretaker, is also a phenomenal cook and is there to offer his service twice daily, for breakfasts and dinners, while his lovely wife, Margarita, assists him in serving the meals. 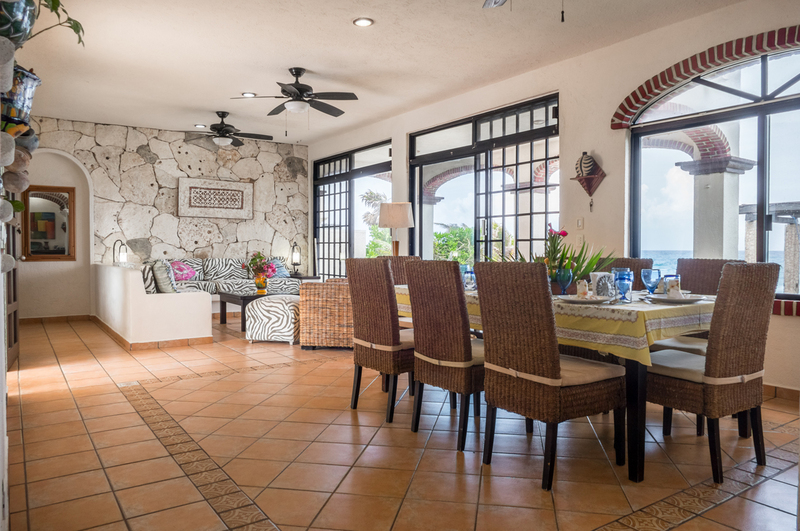 From the pool, step into the cozy, combined living and dining room areas with views of the Caribbean Ocean. 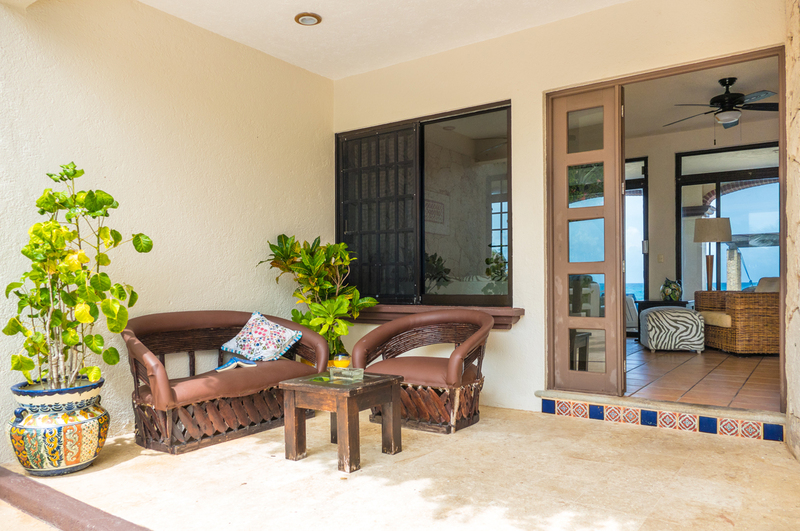 This magical view entices you to step through the sliding glass doors off of Villa Sea Gate's living area and take pleasure in the incredible sight and sound of the waves crashing on the rocks and the warm smell of the sea breezes. 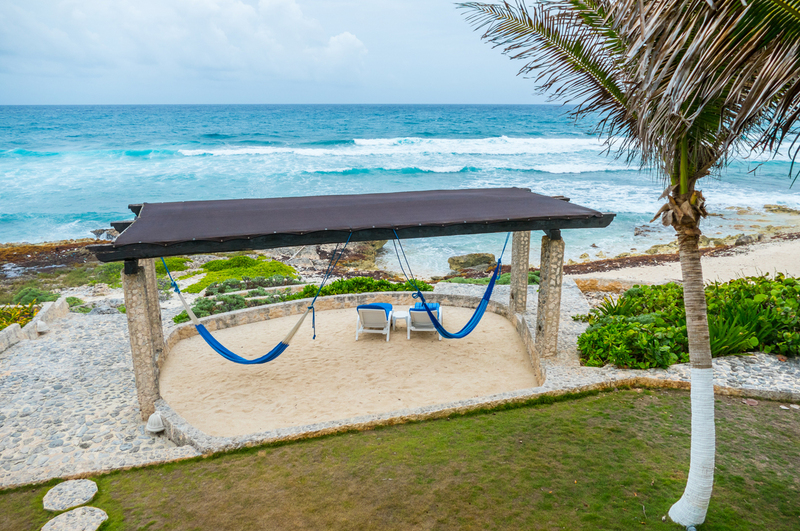 Only a few feet away, closer towards the ocean, is an ample-sized pergola perfect for napping in hammocks while relaxing to the sounds of the sea. 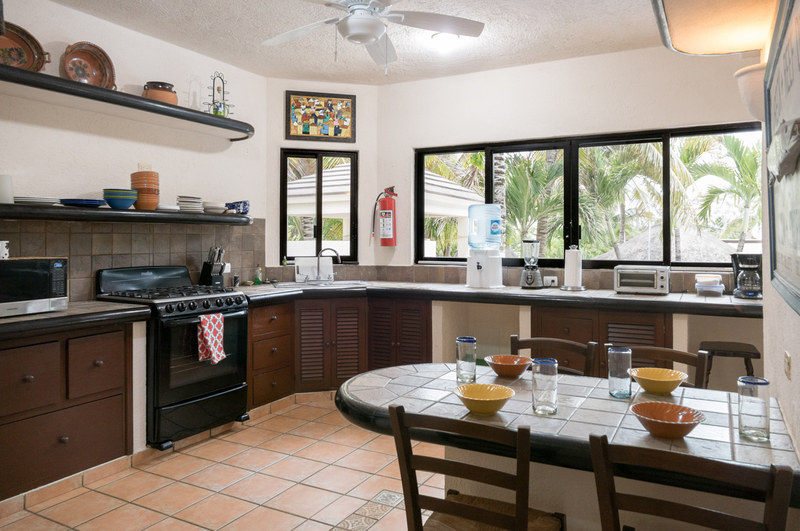 Returning through the sliding glass doors and to the left of the dining area is the spacious, fully equipped kitchen complete with a dishwasher, a breakfast bar with four chairs, an internet connection, fax machine and printer. 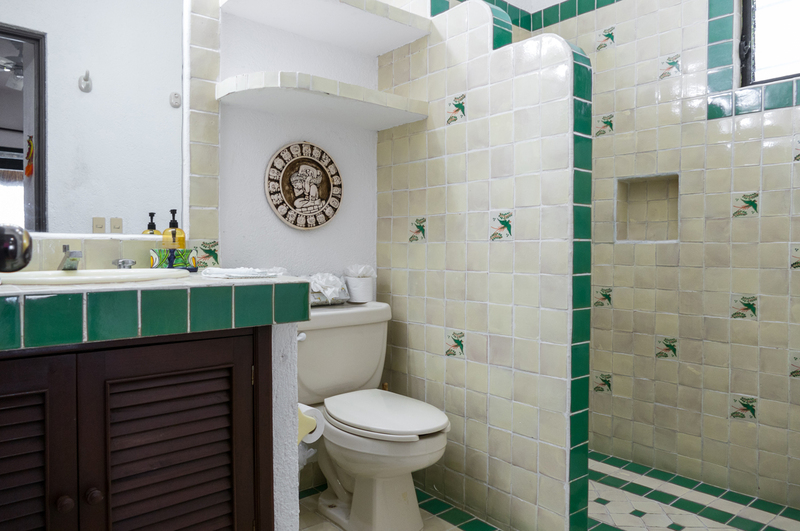 A large safe for storing valuables is located in the oversized pantry and a half bath is conveniently situated near the door which offers the easiest access to the pool. 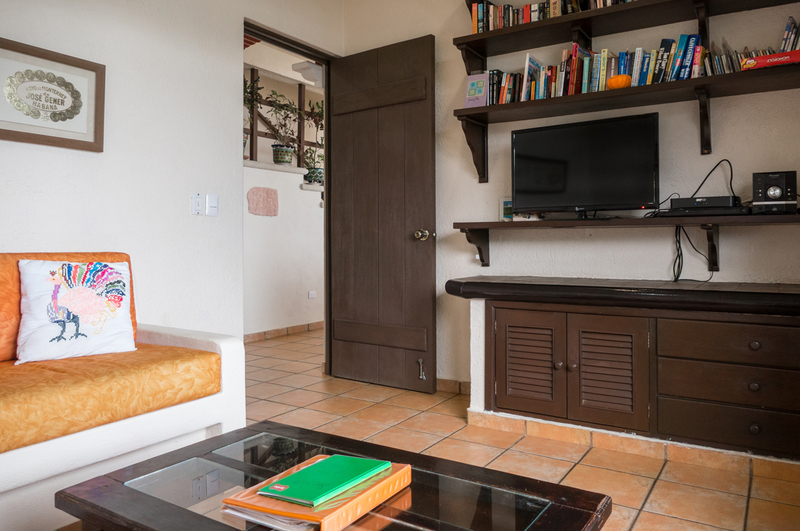 Adjacent to the kitchen is the comfortable, air conditioned TV room with ocean views, Satellite TV with DVD player and a selection of movies as well as a stereo system with a selection of CDs. 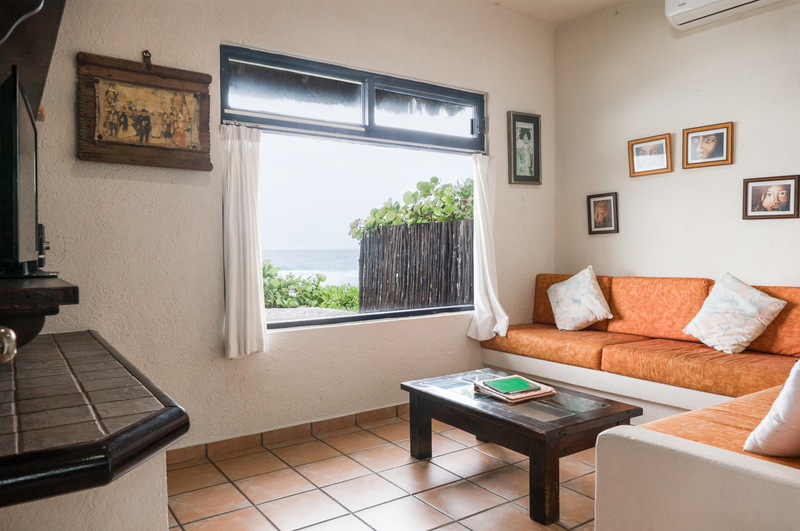 On the far end of the living room is the downstairs guest bedroom which offers a king size bed, gorgeous sea views with its own patio and an en suite bath with stand up shower. The unique stairway off of the living area leads to the three upstairs bedrooms. 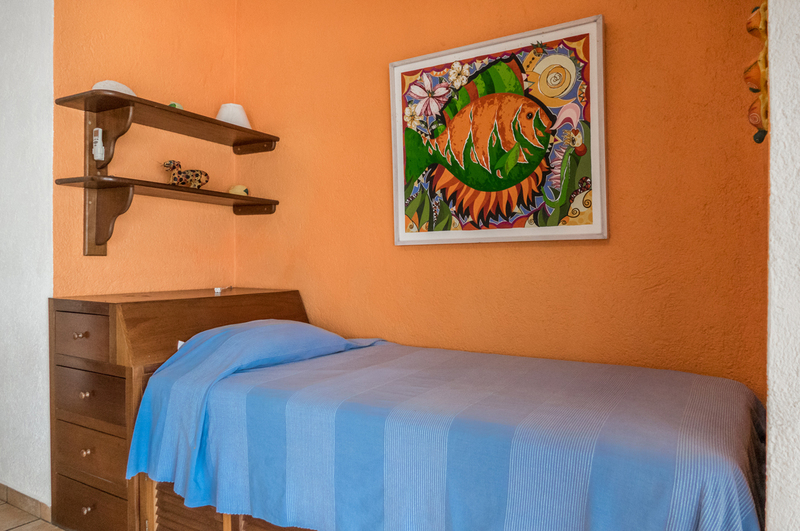 The first bedroom is the childrens room which has two double beds and a single bed. 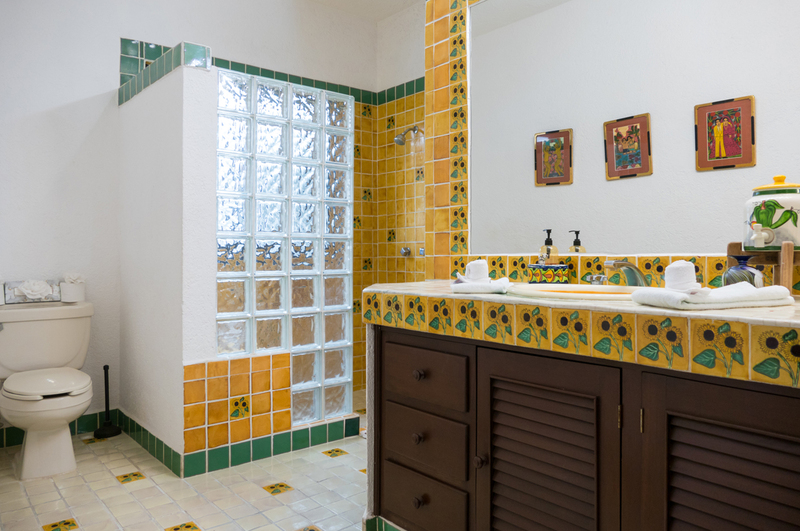 It also has its own bathroom with a large shower tub, skylights and playful wall decorations. 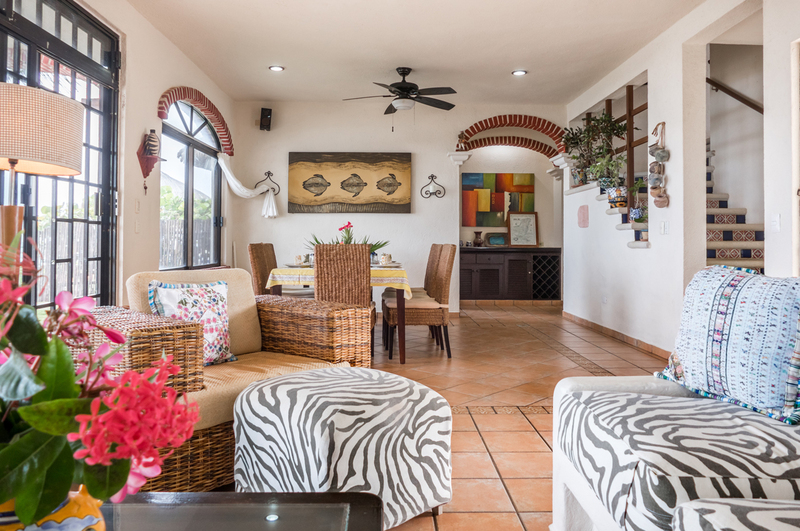 To enter the other two bedrooms, step outside onto the lovely outdoor terrace with pool and jungle views. 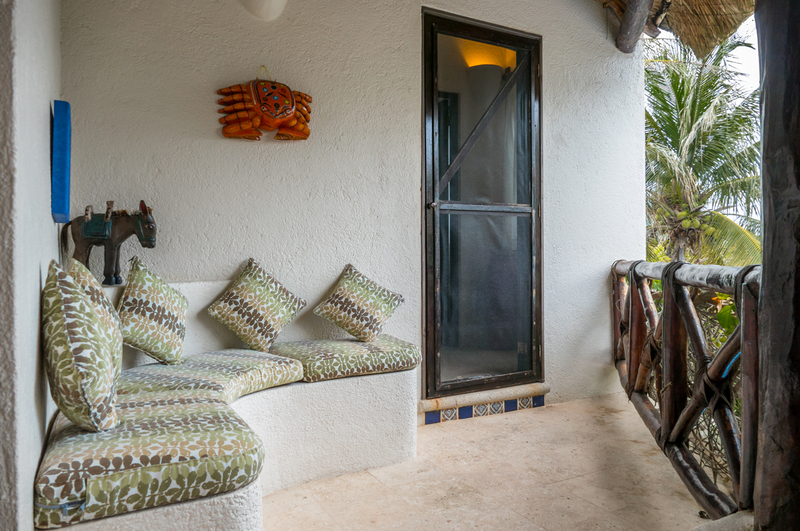 This is the perfect spot for relaxing in the comfortable patio chairs or on the built-in couch while gazing out at the magical sunsets over the lush, green jungle. 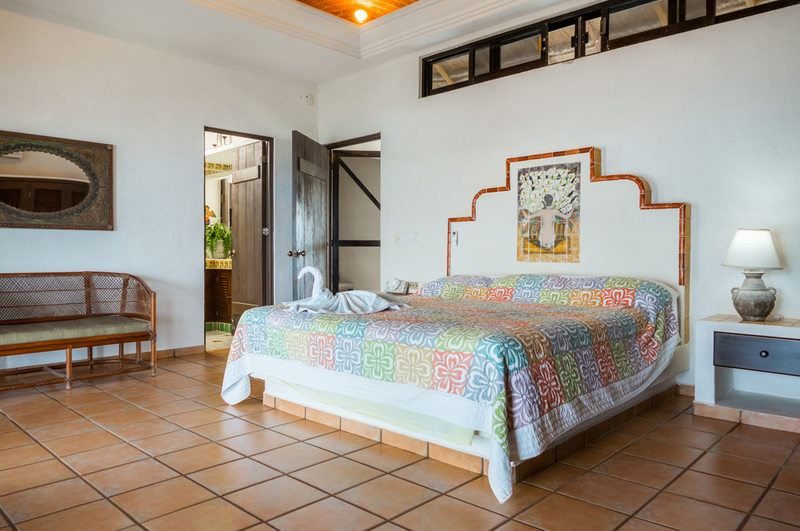 From here, the first bedroom is the expansive master bedroom which boasts a stunning brick-domed ceiling, a king size bed, a reading sofa, a large balcony with hammocks and extraordinary sea views, surround sound speakers and a huge full bath with stand up shower. 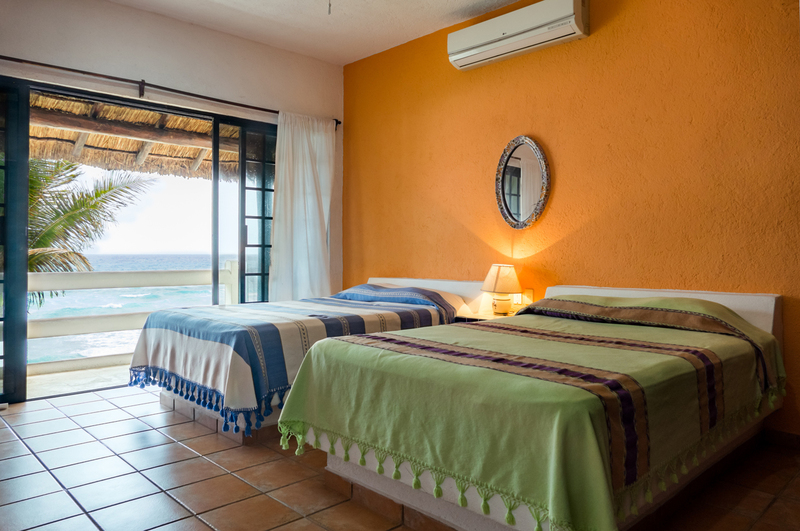 The other bedroom located off of the outdoor terrace offers a king size bed, a roomy balcony with unforgettable ocean views and its own en suite bath with skylights and a stand up shower. 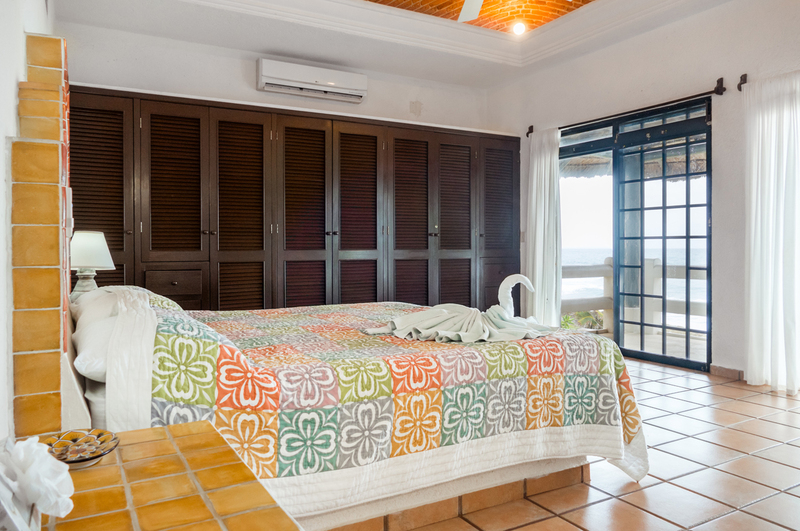 All four spacious bedrooms feature air conditioning, ceiling fans, as well as their own balconies with superb Caribbean views. 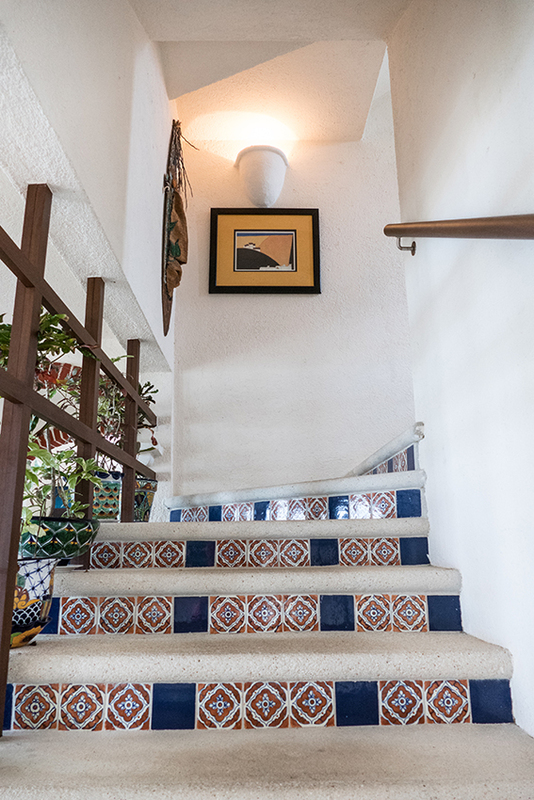 Last, but certainly not least, the upstairs staircase off of the outdoor terrace leads to the third level rooftop observatory with built-in seating, a perfect place to watch the breathtaking sunrises over the sparkling turquoise waters! From here the views are second-to-none. 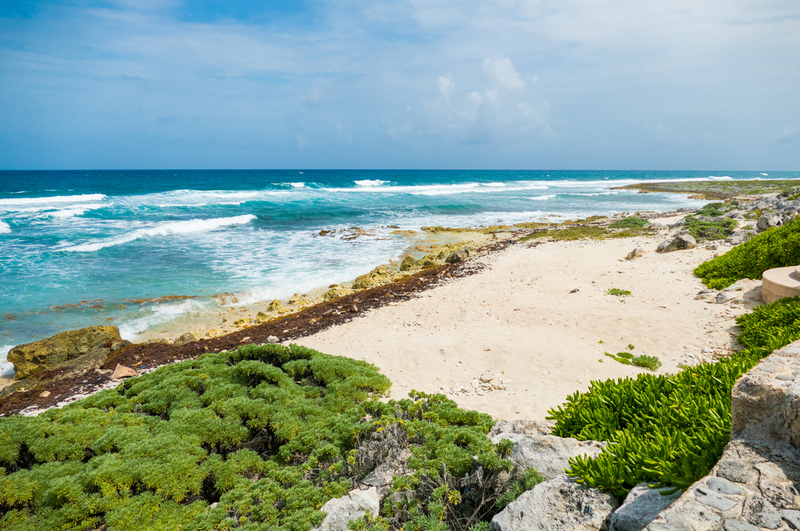 Enjoy a 360 degree view of the vast, blue Caribbean to the east, Akumal Bay the south, Half Moon Bay to the north and the lush, green jungle to the west. 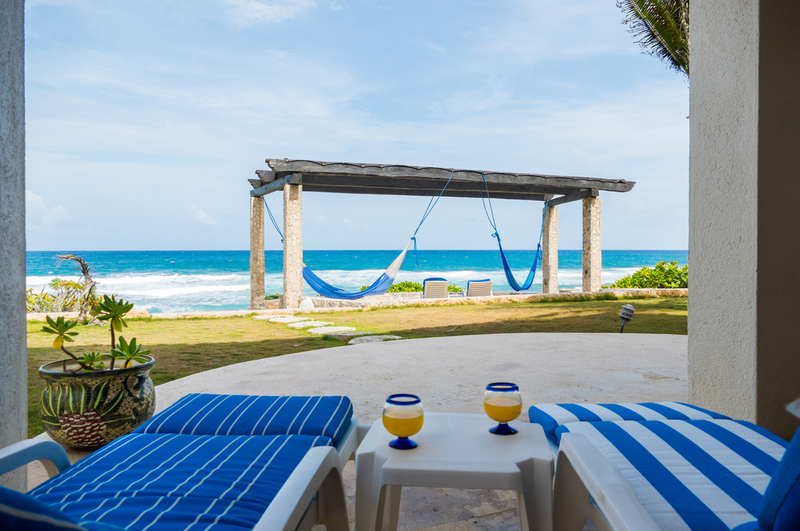 Experience Akumal and the Riviera Maya at its finest while soaking in all of the captivating qualities of Villa Sea Gate and its surroundings. 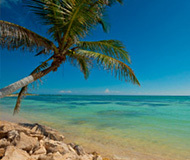 It truly is your home away from home in paradise! 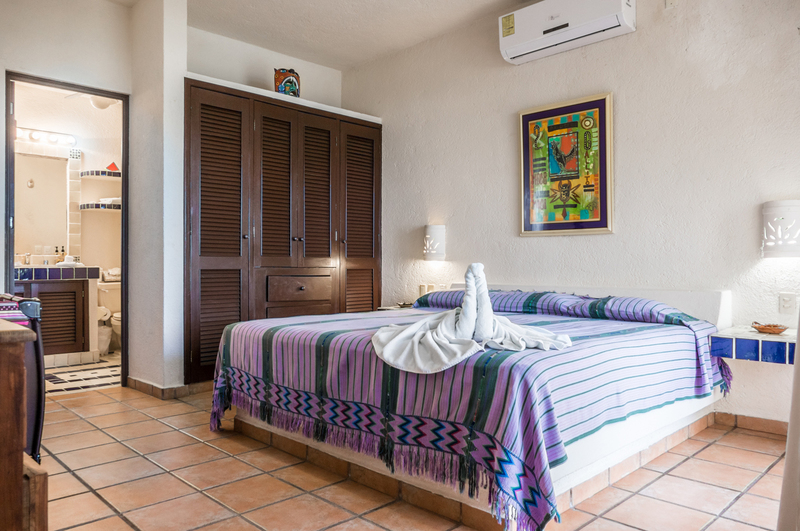 Check the latest Akumal Villas SPECIAL DISCOUNTS! Nothing compares to the beautiful 'Sea Gate Villa.Fantastic location, activities, and villa. You will love, Gregorio (the Master Chef,) and Margarita, his beautiful wife and hostess extraordinaire! We miss them both and are so very thankful to have met them. Brothers and Sisters Reunion! May 12 through May 21, 2012.. Average temp 85 F. light humidity, rained 1 day. Perfect. Relaxation! Akumal is a very quiet, charming town. My family was extremely happy with the beauty of the surroundings, the quality of the house that we stayed in, and the friendliness of all of the people we met. Most everyone we met spoke at least a bit of English. Most of the population lives to the west of the main roadway, while the seaside homes and beaches are on the east side of the roadway. We had no safety concerns at all. 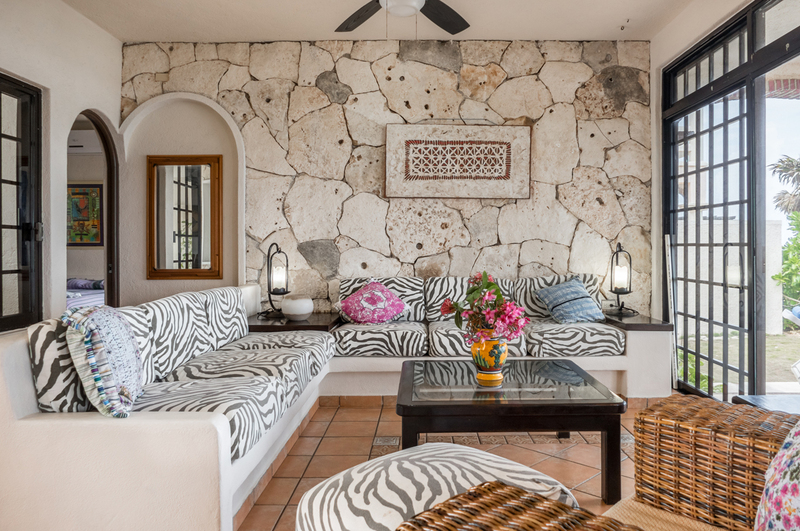 Irina Apostolou- 5 stars for the Villa Sea Gate.The villa was unbelievable, the gate keepers welcoming and the property management excellent. 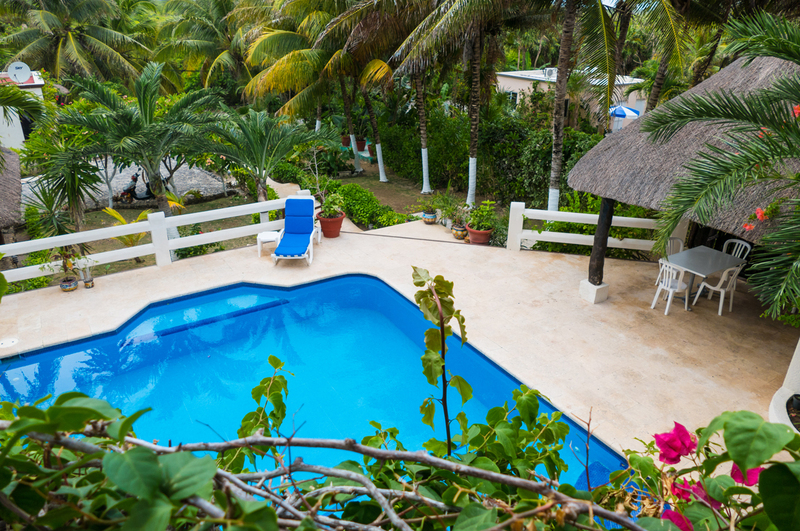 We will definitely recommend both the villa and to our friends. 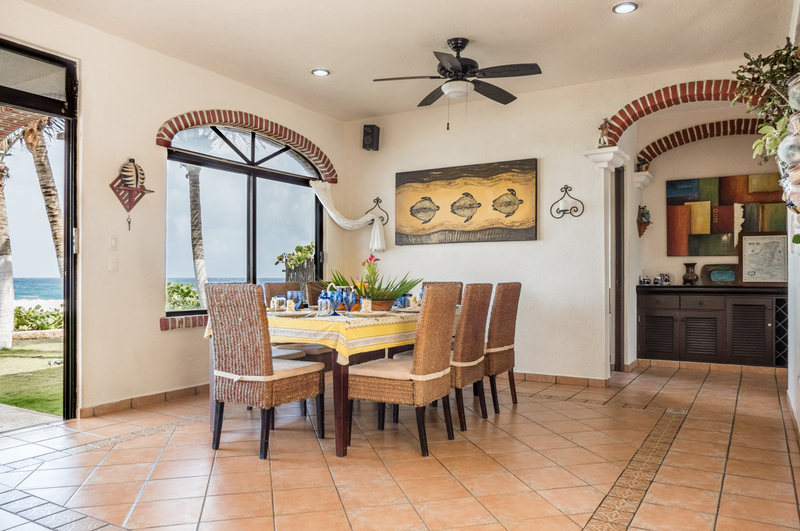 Casa Sea Gate is a gem. 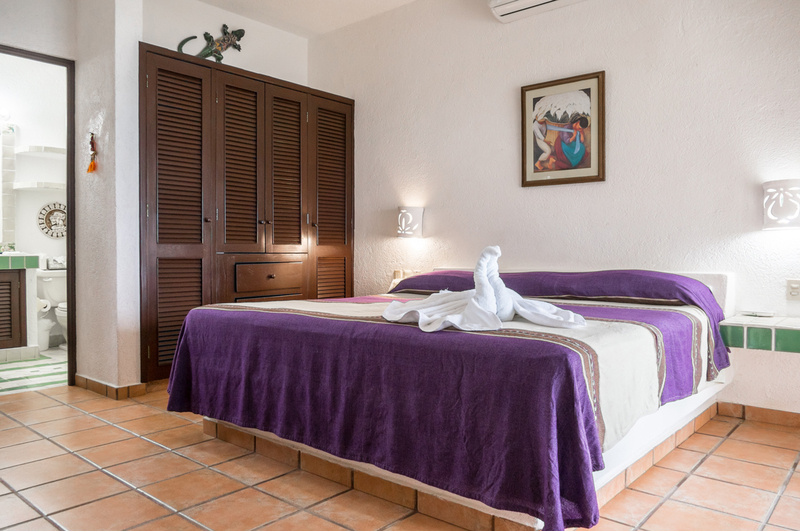 This is our second stay in Akumal (August 2011), and while we also enjoyed the first property we rented on the same block (August 2009), we fell in love with Casa Sea Gate. The property truly is beautiful. Upon our arrival one member of our group couldn't stop saying how overwhelmed she felt because of how beautiful the place was. Not enough good things could be said about the caretakers, Don Gregorio and Margarita. They are SO friendly and professional. They not only keep the grounds in perfect condition, but also go above and beyond to make you feel welcome. The snorkeling was fabulous, The house comfy, food wonderful, especially the dinner Gregorio and Margarita prepared for us. Do not miss Gregorio's flan! It will be the best you have ever tested.After one week we know the roads and feel like Casa Sea Gate is our home.We visited Tulum and Playa del Carmen but spent most of our time right here in Akumal, enjoying the tropical wonderland it offers.Stargazing from the roof was a real treat.We loved the slow peace and relaxation of Akumal and wish we could stay longer - if only to learn more Spanish.Ah well, we shall have fond memories.Muchas gracias! We celebrated our 40th anniversary this week with our children and grand children, what a nice time.The villa was perfect for a multi-generation vacation.The little one's had plenty of space in and out.The parents could relax with the beautiful view and the grand parents could retreat upstairs as necessary.The meal that Gregorio and Margarita prepared was fantastic.We were very pleased with the way we were treated and the cleanliness of the villa and the amenities.Akumal is a great area for family vacations.We would love to return.Thank you. What a wonderful vacation! 2 weeks in paradise, the first week spent with great friends in the perfect spot to relax.The second week with our children, grandchildren (less relaxing but lots of fun) The pool is terrific and a great size. 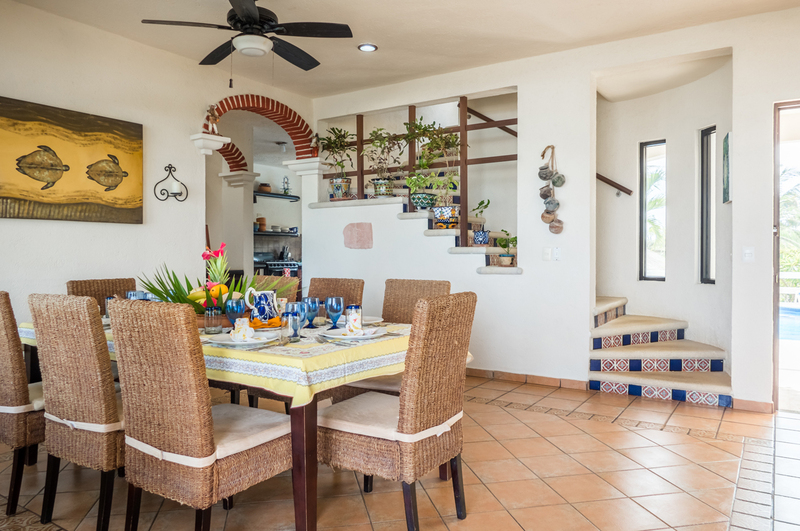 Gregorio"s cooking was superb and I really want to import his flan.This house has wonderful spots for "getting away" from others and equally good spots to gather.The decorating is lovely (must be done by a real pro! )We just couldn't have asked for anything more. This is our 4th time being here in Akumal and this is by far one of the nicest houses we've stayed in!Gregorio's cooking is AMAZING! Make sure you try his coconut flan!We also enjoyed evening walks to and from restaurants.Make sure you check out the sand pit out back - hermit crabs come out every night (and they really enjoy fruit loops)Snorkeling at the local beach can be really good, just make sure that you go out on a day that's not super windy.One day we went out, we saw some baby turtles!We also recommend going to Hidden Worlds!There they have ziplines, cenotes, spider monkeys, and cycles you ride on lines in the air! Gracias para todo! Julie, Paul, Mary Genevieve and Grey Richmond, VA, April 2009 We love Casa Sea Gate!We have traveled all over and this house with its setting in Akumal is perfect!Gregorio, Margarita y Jose are wonderful! Their pescado cena was the best meal we had anywhere.We are also huge coconut flan fans as well. 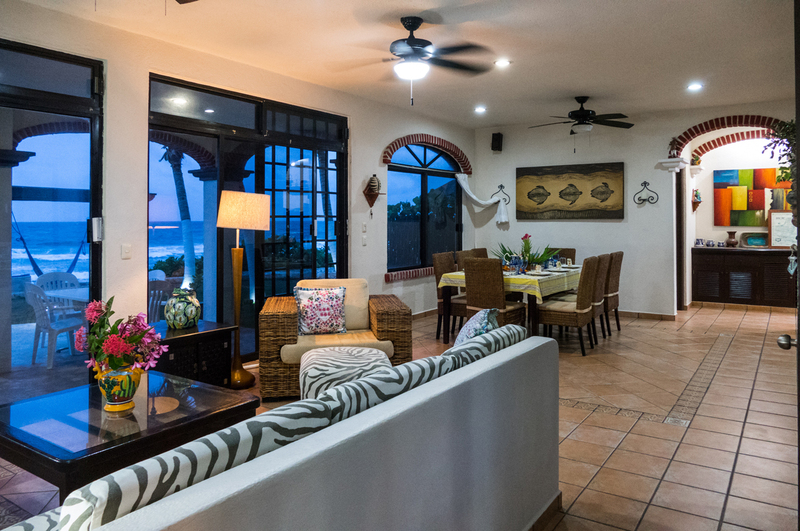 The layout of this house was perfect for us and everyone enjoyed being cuddled to sleep with the ocean.I never want to repeat a vacation but this is one time where I would be tempted! What a beautiful location and home!We couldn't have enjoyed ourselves more.Our brother got married at casa Iguana using a priest and priestess and it was not only interesting, but also very moving spiritually.Akumal is far and away our favorite spot in Mexico so far and we will definitely be back.The snorkeling at the beach is just great, we saw 8 sea turtles in one day! !They were tame and not bothered by the numerous people snorkeling in the area.Now to Gregorio and Margarita - WONDERFUL cooks and housekeepers.Delicious chicken fajitas, rice and homemade flan!Gregorio literally rides his bike to Tulum to pick up the food - a 20-30 min. DRIVE!Anyway, thank you to Gregorio and Margarita for making our stay so easy and enjoyable.We couldn't have asked for more!Uh, and be sure to check out La Buena Vida - delicious chiles rellenos! Family and Friends came to Akumal to celebrate our daughter's college graduation and son's engagement.The trip truly enhanced our joy.Many of us are return visitors to Akumal while others were here for the first time.For those returning, this visit enhanced our love for Mexico and Akumal.For the first time visitors, it is clear that they now understand why we constantly talk about the joys of staying in Akumal - they are clearly hooked.Casa Sea Gate was new to all of us but we can assure you we will back.Gregorio and Margarita were amazing hosts and went out of their way to share their home and community.The meal they prepared for us was the best we had during our week of dining - an amazing experience!We will always remember our trip and the kindnesses extended to us by Margarita, Gregorio and the people of Akumal.Thanks to all who made this so wonderful.